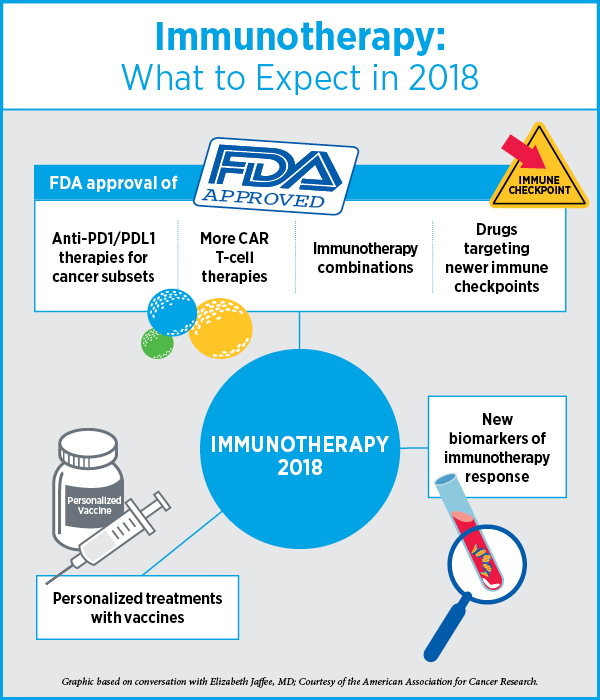 2017 saw many “firsts” in the oncology community, in the form of several revolutionary advances in the research and treatment of cancer, including the U.S. Food and Drug Administration (FDA) approval of an immunotherapeutic to treat patients based on biomarkers rather than the site of tumour origin; the approval of the first CAR T-cell immunotherapy; and the approval of a comprehensive next-gen companion diagnostic test to identify the right patients for the right molecularly targeted therapeutic. In 2017, the FDA also approved the FoundationOne CDx test, which can detect genetic mutations in 324 genes and two genomic signatures in any solid tumour type, and the first “biosimilar” cancer drugs, which could potentially help drive down the costs of some cancer treatments. While immunotherapies lead to long-lasting responses for some patients, a sizable portion of patients do not respond to these agents; some patients who respond ultimately develop resistance; and we still do not have precise biomarkers to predict who will respond and who will not. The same can be said about targeted therapies, where challenges with treatment resistance continue to be a major roadblock. Above all, patients from underrepresented and underserved communities quite often do not benefit from cancer prevention, diagnosis, and treatment advances. She predicts that 2018 will see approval of anti-PD1/PDL1 and anti-CTLA4 antibody therapeutics, as single agents or as combinations, for smaller subsets of different cancers. “We are going from treating melanoma or lung cancer to treating smaller subsets of genetically linked cancers that have a high mutational burden, where anti-PD1/PDL1 antibodies work very well,” notes Jaffee. She predicts that we might see more biomarkers associated with the immunotherapeutics being approved, in addition to microsatellite instability (MSI)-high tumours. Another thing to look for in the near future are more integrative approaches to precision oncology, according to Califano. “We have all been infatuated with the idea that there may be a single magic bullet for solving the cancer problem; for instance by using targeted therapy or immunotherapy approaches, but such views are “rather simplistic,” Califano cautions. “Cancer is a complex disease requiring equally complex solutions that can only be achieved by embracing an integrative and quantitative approach.” Califano speculates that integrating mutation-based targeted therapy and immunotherapy approaches with complementary approaches, such as RNA- and proteomic-based ones, is the next logical step for making precision oncology more “precise” and ultimately more valuable to the patient. “One of the most compelling ‘big things’ emerging in the current research landscape is the use of single-cell technologies,” notes Califano, who also says that these approaches are going to revolutionise the way we think about cancer. 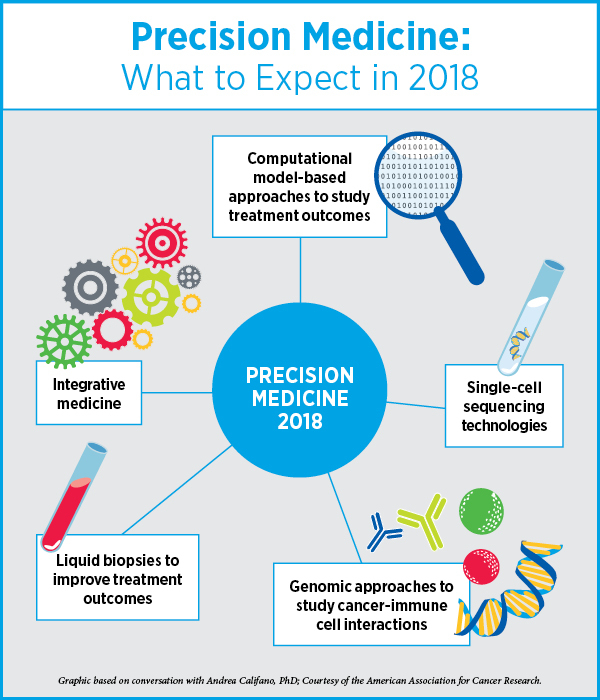 Califano says that liquid biopsies are becoming integral to the landscape of precision oncology; liquid biopsies can potentially detect relapse months earlier than currently possible with traditional methods, such as imaging. This allows the oncologist to switch treatment before the tumour has a chance to become further differentiated, adding to our ability to better control this disease, he says. Califano also commented on the challenges with utilising artificial intelligence (AI) in assisting physicians with identifying the right treatments for patients. “The complexity of biology requires novel paradigms for analysing and interpreting large data sets, both from a genomic perspective and from a computational analysis perspective, and I am very excited about the possibilities and the direction the field is taking to ultimately individualize cancer care on a truly quantitative and predictive basis,” Califano says. 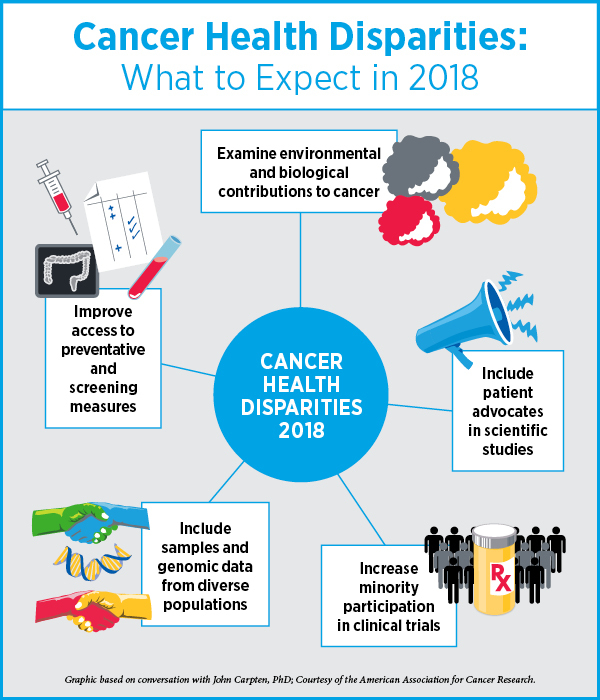 “We are finally seeing a time where there are significant talks between social/behavioural scientists and basic/translational scientists in embracing interdisciplinary approaches to constructively address cancer disparities,” adds Carpten, who is a member of the AACR Minorities in Cancer Research committee. 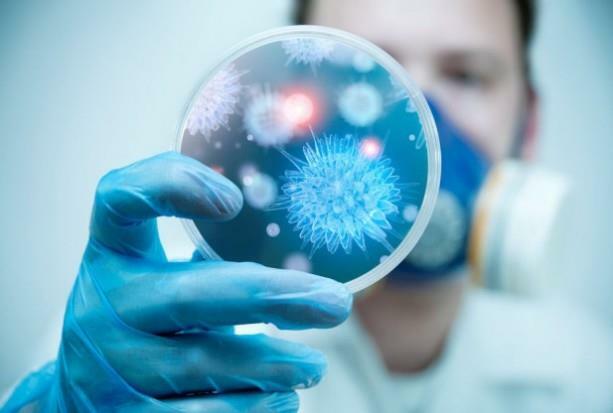 “I think that in the coming years, we will see more studies that integrate data relevant to environmental exposures with molecular data to better understand the effect of environment and stress on cancer, particularly in underrepresented communities,” noted Carpten. “There is this unfortunate reality that as we continue to battle with nationalized health care and the best way to implement it, we will also continue to see a greater divide among communities in access to quality and innovative health care,” Carpten notes. “This is another incredible reason why we have to continue to not only engage but involve minority communities in these processes, and that happens to be a strength of the AACR. I hope to see this organization continue to be a leader in galvanizing advocacy and survivorship communities and integrating them into the scientific community, particularly in relation to translational research and clinical trials,” Carpten says.